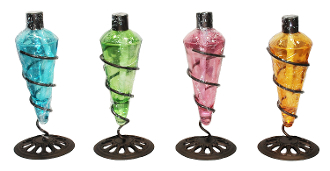 Set of four, one in each different color: aqua, green, magenta, and yellow; For use with citronella or lamp oil; Table top metal bases included. International customers will be responsible for customs duties if any. Aqua, Green, Magenta, and Yellow.